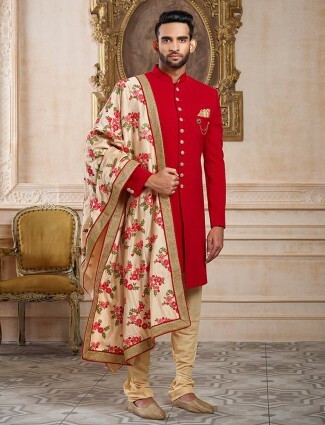 Royalness and Boldness defined by Red Sherwanis for men, designer inspired range of red sherwani collection is available at G3+ Fashion in all styles and types with budget prices. 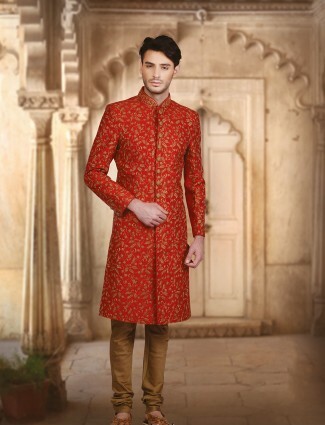 Red Indowestern with a front opening, Red Jacket sherwani, Red 3 Piece Silk Indo western for men and much to take home for your occasions. 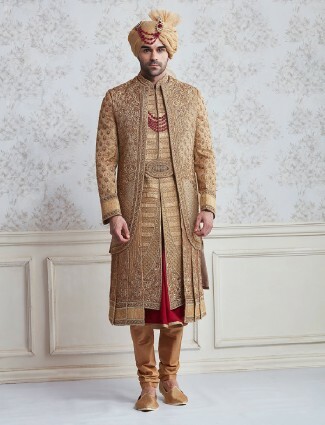 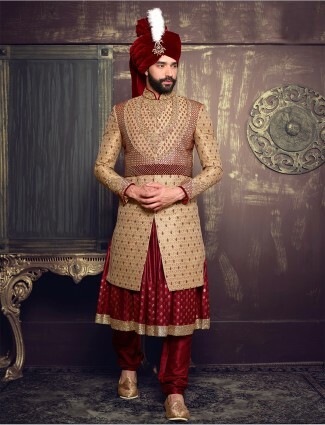 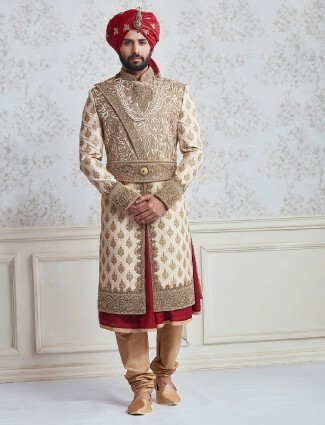 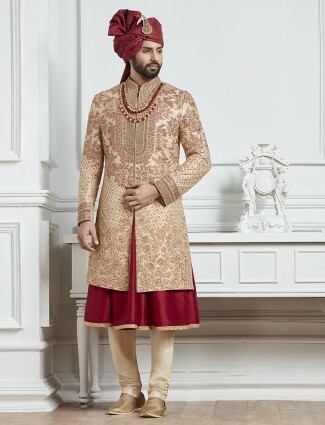 When it comes to weddings and royal attire, we think you can’t disagree with Red Sherwanis for men. 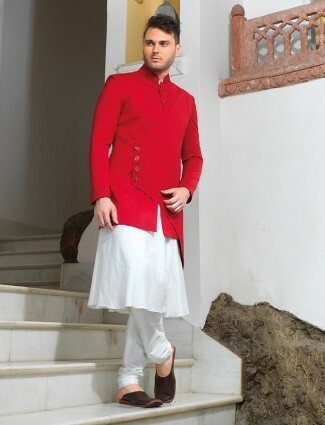 Sherwanis and Indowestern in Red colour just have enough elegance. 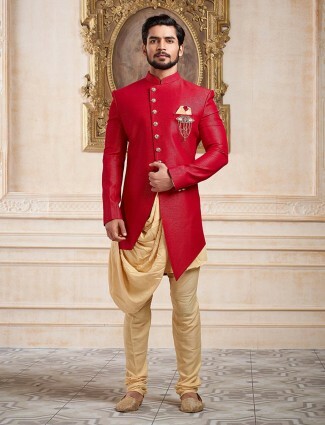 This was an old time thought that men only wore red sherwanis if he were the groom, but now modern weddings or say modern fashion has got this colour to be stunning on groomsmen and guests. 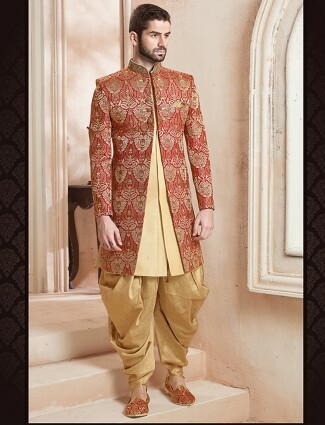 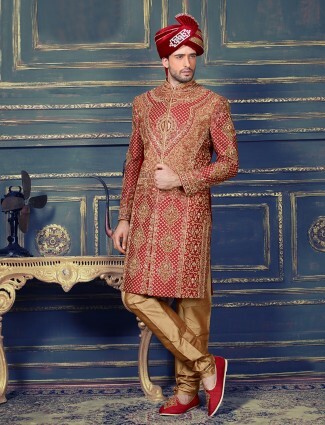 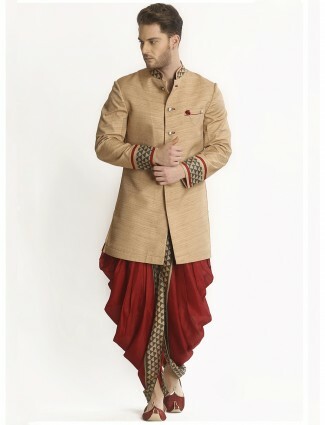 A Brocade red sherwani with the glistening gold motifs is what we think is classy for a groom to dress up in. 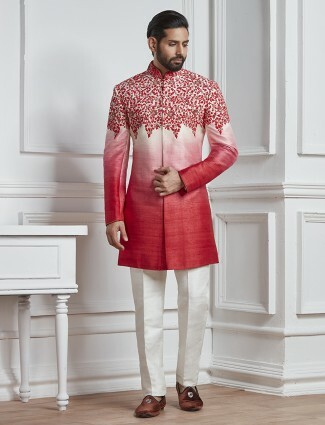 A red velvet indo-western is as well one decent attire to spot up for weddings and receptions. 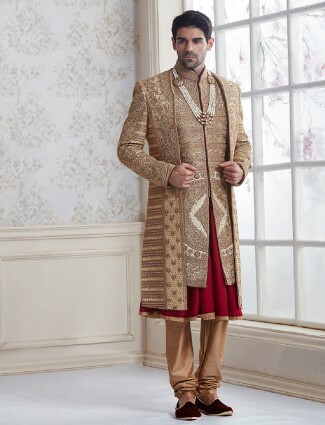 Let’s not forget Pujas and festivals, wearing your silk red indo western in churidar or dhoti pants with a nice silk jacket sherwani is perfect to add that lovely royal look to your personalities. 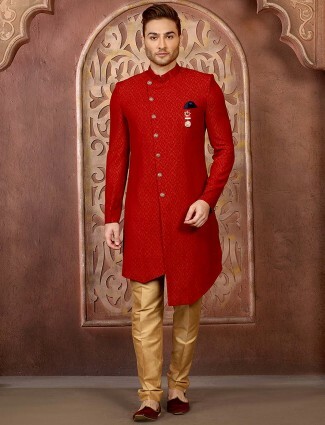 Shopping red embroidered sherwani in shades and tints of new modern cuts is available at G3+ Fashion in latest trends. 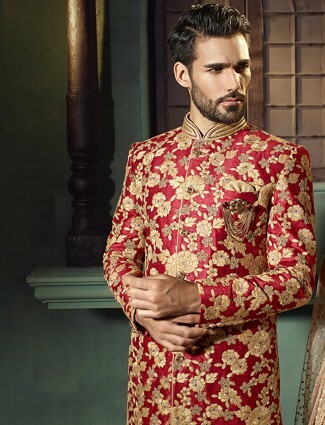 Embroideries in zardosi, diamonds, stones, kundan, and more just add up the ornate to any sherwani or indowestern. 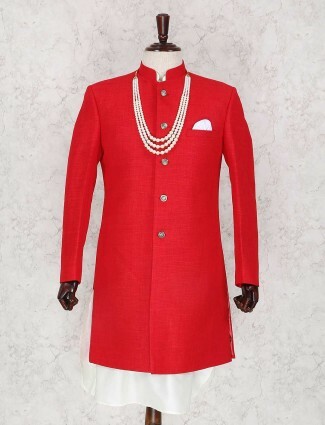 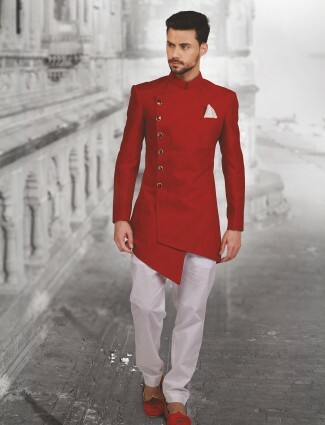 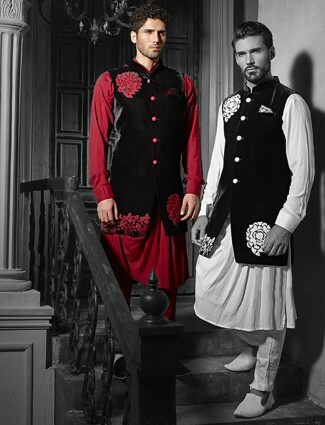 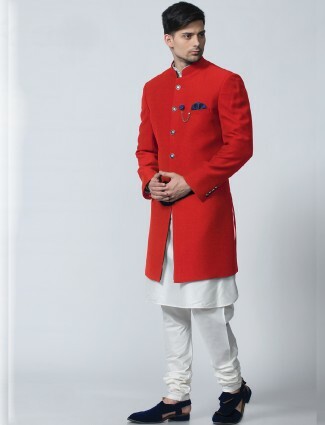 Go the Modern Royal way with our red sherwani collection.